Realizing that kids who grow up playing with Ikea furniture probably turn into college students and adults who buy Ikea furniture, the Swedish manufacturer is going to start producing dollhouse-sized versions of its more iconic pieces, including the Lack table and the Expedit shelving. 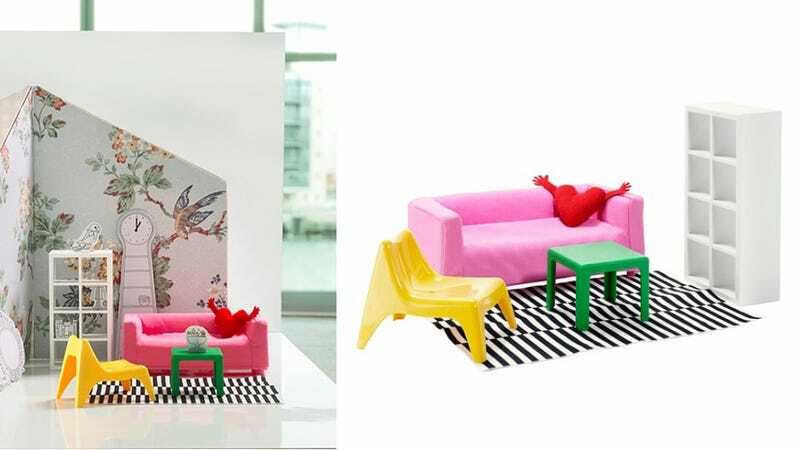 Available in August for about $19 when Ikea's newest catalog is revealed, the set's 1:15 scale packaging will also include cut-out paper accessories like clocks and picture frames to further adorn a dollhouse. And unlike the regular-sized versions of these pieces, the dollhouse set comes fully assembled so Barbie or G.I. Joe don't have to battle their way through an assembly manual armed with a teeny tiny hex wrench.